The West Indian Championship Fifth round had contrasting winners from the previous round. Leeward Islands Hurricanes topped Guyana Jaguars to close the gap on the leaders. Barbados Pride made light work of Trinidad and Tobago Red Force. While Jamaica Scorpions recorded their first victory this season against Windwards Volcanoes. Batting first Guyana Jaguars posted a modest 196. Christopher Barnwell 58 and Leon Johnson 44 were the main contributors with the bat. Rakheem Cornwall was on the ball as usual, snaring 4/70 alongside Damion Jacobs 3/15 for Leewards. Hurricanes surrendered first innings lead as they fell short at 175. Jacobs 34 not out and Terrence Warde 30 were two among four cameos by the Leewards batsmen. Clinton Pestano 4/50 and Romario Shepherd 3/29 were the chief wicket takers for the Jaguars. In the second innings Guyana posted a competitive score of 269 to set the Hurricanes 290 for victory. Tagnarine Chanderpaul 40, Shepherd 39 and Pestano 46 not out carried their bats for the Jaguars. 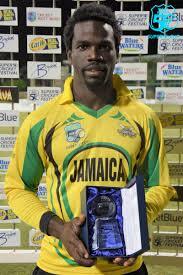 Cornwall 6/70 and Jacobs 2/90 led the Leewards bowling attack again for the second time in the match. Montcin Hodge 127 and Keacy Carty 67 provided the platform for the Hurricanes to blow away the perennial giants by two wickets in the end. Veerasammy Permaul tried his best with 4/43, while Keemo Paul and Shepherd supported with two wickets each. Trinidad and Tobago Red Force returned home following their win over Jamaica Scorpions. But is was the Barbados Pride who enjoyed the better of the exchanges at the Brian Lara Stadium. Batting first Red Force left a lot to be desired as seamer Kevin Stoute bagged 6/35 to restrict Trinidad and Tobago to 170. Only Yannick Cariah with 36 offered any resistance. Pride were able to post a 45 run lead, scoring 215. Shamar Springer and Nicholas Kirton both scored 47 to ensure that Barbados gained first innings rights. Seamers Anderson Phillips 3/73 and Odean Smith 3/32 were the best with the ball for the Red Force. Trinidad and Tobago’s batting woes continued at their home ground as they were routed for a paltry 103. Imran Khan 25 and Odean Smith 28 did their best to fend off the Barbadian assault. Springer 4/24 and Marquino Mindley 4/47 were the destroyers for the Pride. Barbados lost three wickets getting to the target of 59. Windwards Volcanoes batted first against cellar place Jamaica Scorpions. The evergreen Devon Smith record his second hundred this season, 124, his 36th First Class ton. Kaveem Hodge scored 56 and Denis Smith 49. For the Scorpions Dennis Bulli bagged 5/94 and Jerome Taylor and Derval Green nabbed two wickets each. Jamaica fell 13 runs short of the total set by the Volcanoes in getting to 272. Chadwick Walton 125, scored his second century this season with Brandon King in tow with 52. Bowling for Windwards, Larry Edwards had 4/79 while Kaveem Hodge and Ray Jordan picked up two wickets each. Batting a second time the Volcanoes could only manage 198 to set the Scorpions 211. Devon Smith followed up his first innings exploits with 47 as did Kaveem Hodge with 52. Bulli was again the leading wicket taker with 5/54. Walton too, got into the act with 2/10. Walton completed the victory for Jamaica with 79, alongside Brandon King 58. Tyrone Theophile 4/44 lead the Volcanoes’ effort, but it was not enough as the Scorpions won by six wickets.